I love finding little natural treasures, like a piece of quartz, a curled leaf, a bird’s soft feather, a weathered piece of wood and when I visit the beach I love collecting beach glass! That I’ll run out of time to write all the stories and poems I want to write and related to that: to file, de-clutter and recycle paper, mementos and snippets that I’ve collected over my lifetime- my family wouldn’t know what to do with it all. Lyrical, sensory, imagery, detailed, fast-moving, unexpected, atmospheric, longhand, poetic, mysterious. determined, spontaneous, reliable, meditative, wordaholic. The princess from a very old story book called The Princess and Curdie. I’d chose this character as she had a wonderful, loving grandmother, with long hair, and my very own grandmother possessed such magical and special qualities. As a child I loved this book. To the gold rushes in Victoria, to look at the way a tent town forms into a prosperous town and really look at the way the people lived and how fortunes were found and lost. I am fascinated with this part of our history. Ah, so you continued with our heartfelt desire and need to write, good on you, keep going. The achievements of my contemporaries like Janeen Brian, Claire Saxby, Glenda Millard, to name a few, who work so hard across many genres and show me by their talent and perseverance that publication is possible. A desire from within, the excitement and out of world experience from reading and recreating myown world perspective through writing. It was inherent, a gift, from about the age of 8, yet perversely I was not classified as a promising or bright student in my primary school days. The burning desire has been fanned all my life. At the moment it’s ‘finish’, because going back to the question- ‘what is your greatest fear?’ I realize that I’m making lots of beginnings and striding onto the middle of stories but never finishing some and that’s a discipline I need to practice. The Bible, there is so much fabulous writing especially the Psalms (written by King David), as well as economy, imagery, rhythm and wonderful life lessons. 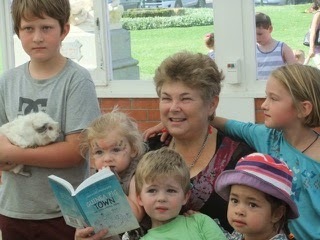 Lorraine Marwood is an Australian poet and children's author whose novels include Star Jumps and Ratwhiskers and Me. 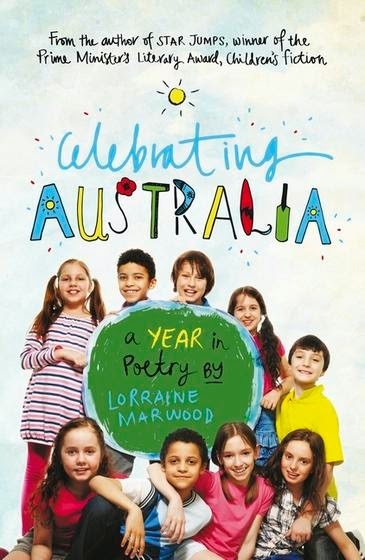 She has also published several poetry anthologies including Note on the Door and the recently released Celebrating Australia: A Year in Poetry, published by Walker Books Australia. Visit Lorraine's website and Facebook page for more information about her books and writing. 6th March Janeen Brian: Topic: How you create for the creators: how you create ideas to excite children and adults to write poems of their own. 9th March Alphabet Soup: Topic: Writing a class poem - the results!